These students are participating in a special ceremony at the beginning of the school year. Photo from Itayanagi Town Website. In early April, all the students in a school gather for a formal ceremony welcoming the new students. At this ceremony, new students are introduced to the other students and teachers and the teachers and principal have a chance to talk to the new students. Many of the parents of the new students attend this ceremony, often dressed formally, as a way to show support for their children and to meet some of the other parents and teachers. The ceremony marks a new period of the students’ lives, as they are now in a new school and at a new stage of life. Like the cherry blossoms, students in their new school uniforms heading to school for the start of the new school year is a common sight in the springtime in Japan. 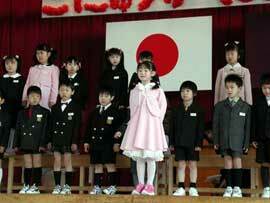 There are also ceremonies that mark the beginning and the end of each semester in Japanese schools. These ceremonies, while not as formal as the entrance ceremony, are formal. Students are expected to listen quietly to speeches and announcements from the principal. Goals for the new semester are announced at the opening ceremonies. Events of the past semester are highlighted during closing ceremonies.